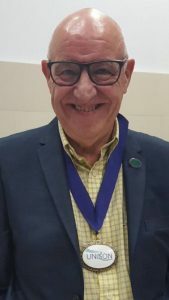 Eric Roberts, proud Dad to Jack and Rhian, London Ambulance Service Unison Branch Secretary, member of Unison’s National Executive Committee and President of Unison, died on November 24th, 2016. I was lucky to be his girlfriend since 2003 and he brought extraordinary happiness to my life as he did to the lives of many others. I bought this domain for him a while back and I want to make it a place where I and others can remember him in all his many capacities for the wonderful person that he was. I have started to build the site, although there is so much more that could be said and shown. If you want to leave a comment or memory please do so below, or send me an email to Eric@kathyj.com and I will make sure your words and pictures are posted in due course. I will miss lovely Eric. We all miss Eric and the office seems empty. He was a great man and helped everyone that needed it. I loved Eric’s sense of fun. He told me once that he was visiting New York and I mentioned that my Sister worked in the underwear department at Macy’s in Manhattan. At few days later he text me to say ” I am in the lingerie department at Macy’s in New York I can’t see your Sister but I am not leaving .” I said please leave Eric you’ll get arrested! He sent a thumbs up icon back. Wonderful event to celebrate dear Eric last week. And a wonderful post on facebook from Dave Jervis, erstwhile Director Communications at LAS. Eric made the world a better place. He is missed so much. I had the honour of working with Eric at the LAS for a number of years and then knowing him as a dear friend for a long time after I moved on. He was always caring, principled, funny and delightfully naughty! Much love to Kathy, Eric’s family, friends and colleagues at this difficult time. We miss you so much and feel the egg on the moon shaped void.